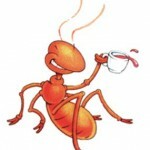 Ants are little pests, extremely little pests, which is one of the reasons it is so hard to get ride of them. They can invade your home through the smallest of cracks and quickly organize themselves into colonies that always seem to find ways to steal your food, no matter how well you protect them. 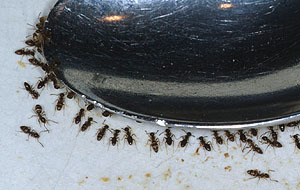 Ants can find their way into jars, Tupperware, cereal boxes, etc. and compromise your food which, in addition to being entirely maddening, is very costly. Ants in your house can also interrupt your peace of mind. It seems as though they can appear out of solid walls, running trails that lead into your electrical fixtures or baseboards, adding to their colony. Below are some ways that can show how to get rid of ants, for good! The first thing one can try to do is simply clean up the house. This might seem obvious, but if the house is clean, then there is no food for the ants to feast on. This might be more difficult than one thinks. Ants will pick up on the smallest sent, the smallest morsel of food. It is good to properly seal all of your containers, wipe down your counter tops and clean your dishes so that they do not stack up and remain long enough for the ants to take notice. It is also good to keep your floors swept and mopped. Another option is to properly seal any seams you have in your house. It helps to caulk your window seams and door jams. 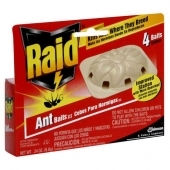 This will prevent ants from finding any open conduits to travel through. An additional benefit to using caulk is that it can also help reign in energy costs by providing better temperature control. There are certain substances you can put at suspected entryways that deter ants from passing. Talc powder or salt can be used for this method. There is also a substance called diatomaceous earth that will dehydrate the ants to death, although, this substance can be harmful to household pets, so use with caution. In addition, cornmeal can be a tool to kill ants. If ants eat the cornmeal and then consume water, the cornmeal expands and kills the ant. One could simply poison the ants as well. A lot of poisons can be concocted with items in your own home, such as maple syrup combined with borax. A small amount of research on the Internet can reveal a number of homemade ant killers. Of course, there are also certain substances that can be purchased from certain retail stores, but be sure to read the directions carefully. Last but not least, there is always the option of fogging these pesky ants. A quick call to the exterminator is a sure way to get rid of ants. The only drawback to this method is the cost, but sometimes it is the only suitable option. Ants that continue to appear in your house, even after all previous attempts to get rid of them, may require more direct action. This post is beyond awesome. I was always wondering what to do with my ant problem. They keep causing a lot of problems in our kitchen and we can’t seem to ever completely get rid of the ants. So I’ll try out some of these tips and see how it goes.